It was a session for a Starz documentary called “America to Me,” covering an academic year at a suburban Chicago high school and how issues of race and privilege affect education. 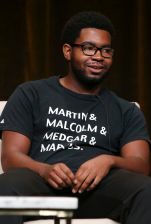 And on the panel, one of its articulate subjects, a spoken word artist named Charles Donalson III couldn’t get over the opulent setting of the TV Critics Association summer press tour. “Jesus Christ, do you all know how much food there is out there?” he exclaimed, referring to the lavish breakfast buffet that had been offered outside the ballroom doors. “I’m being dead serious right now,” he snapped, when some reacted to his food observation. “Do you all know how much food it is out there?” he repeated. “You all see all this stuff? When I was in here yesterday, and I’m watching all the money it probably take to just set up this room, and you — like there is literally situations like this where we’re hoarding wealth. It’s the same thing that’s happening at his school, Donalson said. “And that’s same thing this entire country is doing. .. It’s because the people in power don’t wanna give us the money that they have. They don’t want to give us the privileges they have. . They don’t even wanna give us books! So he had a suggestion for the TV writers. It involved more than writing a blurb about his docs-series. And in the short term, no one went to the buffet for seconds. “America to Me” premieres Aug. 26 at 10 p.m. on Starz.